Finebaum’s Fiscal Lift: What’s the right call for Paul? When it comes to sports, few broadcasting markets are as hungry and crazed as Birmingham. Thus, the changes that are on the horizon should bring as much attention as fiscal cliff negotiations. Forget that: more attention. I mean, here the negotiations will result in real change. Probably the two biggest changes, which will interest all fans, involve sports talk show host Paul Finebaum and the ownership of 97.3 The Zone. This post will cover Part I: Finebaum. As everyone who has been following him knows, his contract with Citadel Broadcasting (and its owner, Atlanta-based Cumulus Broadcasting), which owns WJOX, ends on Jan. 21, 2013. Attempts to get out of the contract early (citing changes forced on him by Citadel before it was purchased by Cumulus) to pursue an offer by Cox Media Group and 97.3 the Zone, resulted only in a lawsuit that was settled over the summer. Finebaum could not talk much about the pending change. (We’ll come back to that in a few paragraphs.) But one thing that he did confirm is that he is now being represented by Nick Khan, of the high-powered Creative Artists Agency. Khan is typical CAA stock: One of his other new clients is Kirk Herbstreit (adding to a roster that already included Nancy Grace and Keith Olbermann). Even so, with a new agent and possibly new opportunities, he was reluctant to discuss any pending changes. It’s clear why. In the June 1, 2012, issue of Talkers magazine, John Dickey, COO of Cumulus, addressed the possibility that Finebaum would move to The Zone when his contract ended on Jan. 21. “He will never work for Cox in Birmingham,” Dickey said, bluntly. Talk like that makes the situation beyond delicate. The contract — you can find it in the link above – sheds more light on Finebaum’s situation. First, according to the original contract, which was signed in January 2007, even if Finebaum were to end the contract amicably on Jan. 21, 2013, he would not have been allowed to broadcast within a 50-mile radius of Birmingham for the next 90 days, because of a non-compete clause (Section 11[c]). Cumulus has continued to move aggressively in the sports radio market. Cumulus has dropped ESPN and picked up the new CBS Sports Radio network for many of its affiliates, including WJOX in Birmingham, as of Wednesday, Jan. 2. So they might want to keep Finebaum in the package that now includes Jim Rome and Tim Brando. Finally, if you read Finebaum’s contract, you realize that it is an employment contract. 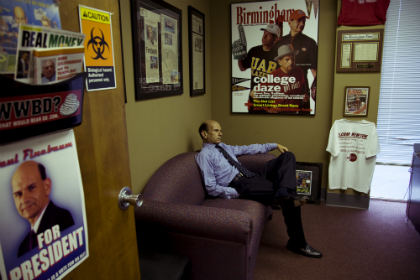 Despite his show’s success and growing popularity, Finebaum holds no ownership interest in the program or any of its related projects (the website or podcasts, for example). Thus, while I could not ask Finebaum about his priorities for a new contract, it would certainly make sense that at this point, given the show’s expanding popularity and nationwide footprint on Sirius XM, he would seek an arrangement that allowed some ownership stake of his program. Or he could conceivably even create his own company to produce the program and syndicate it himself to individual stations or through a company such as Cox. Or try this scenario (which a friend suggested, though it exists only in the imagination): Assume that the SEC decided to spurn ESPN’s mega-billions and create its own network along the lines of the Big Ten Network — the main difference being the quality of the football teams, of course. Given Finebaum’s friendship with Mike Slive, SEC commissioner, and his stature within the SEC, a television version of Finebaum’s show, like “Mike & Mike” on ESPN2, would be a natural for the afternoons. Finebaum’s show has remained an attractive property over the years, with much interest from prospective bidders. It was when he jumped from Clear Channel to Citadel in 2007, and it remains so today. So as Jan. 21 approaches (with an extension of up to 45 days allowed), Finebaum’s listeners and those who hate him can expect that the drama on the show might originate not from Legend and Tammy, but from Finebaum and his parent company. * Ed. note: That 2010 interview was technically for Auburn Magazine. John Carvalho, associate professor of journalism at Auburn, blogs about the sports media at johncarvalhoau.tumblr.com. Find him on Twitter at @johncarvalhoau. Read his previous columns here.